Welcome to part 3 of our 4-part blog series. Deep learning is a subset of machine learning that has attracted worldwide attention for its recent success solving particularly hard and large-scale problems in areas such as speech recognition, natural language processing, and image classification. Deep learning is a refinement of ANNs, which, as discussed earlier, “loosely” emulate how the human brain learns and solves problems. Before diving into how deep learning works, it’s important to first understand how ANNs work. ANNs are made up of an interconnected group of neurons, similar to the network of neurons in the brain. 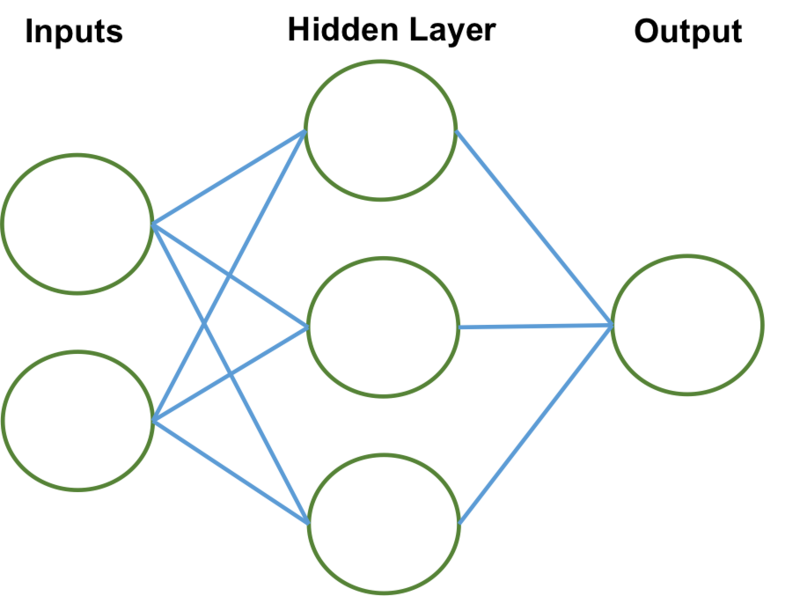 At a simplistic level, a neuron in a neural network is a unit that receives a number of inputs (xi), performs a computation on the inputs, and then sends the output to other nodes or neurons in the network. Weights (wj), or parameters, represent the strength of the input connection and can be either positive or negative. The inputs are multiplied by the associated weights (x1w1, x2w2,..) and the neuron adds the output from all inputs. The final step is that a neuron performs a computation, or activation function. The activation function (sigmoid function is popular) allows an ANN to model complex nonlinear patterns that simpler models may not represent correctly. Figure 2 represents a neural network. The first layer is called the input layer and is where features (x1, x2, x3) are input. The second layer is called the hidden layer. Any layer that is not an input or output layer is a hidden layer. Deep learning was originally coined because of the multiple levels of hidden layers. Networks typically contain more than 3 hidden layers, and in some cases more than 1,200 hidden layers. What is the benefit of multiple hidden layers? Certain patterns may need deeper investigation that can be surfaced with the additional hidden layers. Image classification is an area where deep learning can achieve high performance on very hard visual recognition tasks – even exceeding human performance in certain areas. Let’s illustrate this point with an example of how additional hidden layers help perform facial recognition. When a picture is input into a deep learning network, it is first decomposed into image pixels. The algorithm will then look for patterns of shapes at certain locations in the image. The first hidden layer might try to uncover specific facial patterns: eyes, mouth, nose, ears. Adding an additional hidden layer deconstructs the facial patterns into more granular attributes. For example, a “mouth” could be further deconstructed into “teeth”, “lips”, “gums”, etc. Adding additional hidden layers can devolve these patterns even further to recognize the subtlest nuances. The end result is that a deep learning network can break down a very complicated problem into a set of simple questions. The hidden layers are essentially a hierarchical grouping of different variables that provide a better defined relationship. Currently, most deep learning algorithms are supervised; thus, deep learning models are trained against a known truth. The purpose of training a deep learning model is to reduce the cost function, which is the discrepancy between the expected output and the real output. The connections between the nodes will have specific weights that need to be refined to minimize the discrepancy. By modifying the weights, we can minimize the cost function to its global minimum, which means we’ve reduced the error in our model to its lowest value. The reason deep learning is so computationally intensive is that it requires finding the correct set of weights within millions or billions of connections. This is where constant iteration is required as new sequences of weights are tested repeatedly to find the point where the cost function is at its global minimum. A common technique in deep learning is to use backpropagation gradient descent. Gradient descent emerged as an efficient mathematical optimization that works effectively with a large number of dimensions (or features) without having to perform brute force dimensionality analysis. Gradient descent works by computing a gradient (or slope) in the direction of the function global minimum based on the weights. During training, weights are first randomly assigned, and an error is calculated. Based on the error, gradient descent will then modify the weights, backpropagate the updated weights through the multiple layers, and retrain the model such that the cost function moves towards the global minimum. This continues iteratively until the cost function reaches the global minimum. 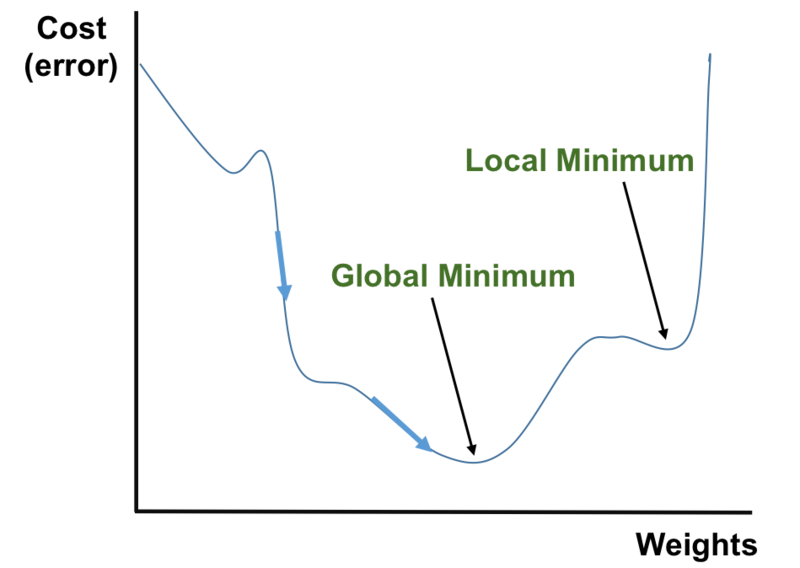 There may be instances where gradient descent resolves itself at a local minimum instead of global minimum. Methods to mitigate this issue is to use a convex function or generate more randomness for the parameters. Non-relational databases have played an integral role in the recent advancement of the technology enabling machine learning and deep learning. The ability to collect and store large volumes of structured and unstructured data has provided deep learning with the raw material needed to improve predictions. When building a deep learning application, there are certain considerations to keep in mind when selecting a database for management of underlying data. Flexible Data Model. In deep learning there are three stages where data needs to be persisted – input data, training data, and results data. Deep learning is a dynamic process that typically involves significant experimentation. For example, it is not uncommon for frequent modifications to occur during the experimentation process – tuning hyperparameters, adding unstructured input data, modifying the results output – as new information and insights are uncovered. Therefore, it is important to choose a database that is built on a flexible data model, avoiding the need to perform costly schema migrations whenever data structures need to change. Scale. One of the biggest challenges of deep learning is the time required to train a model. Deep learning models can take weeks to train – as algorithms such as gradient descent may require many iterations of matrix operations involving billions of parameters. In order to reduce training times, deep learning frameworks try to parallelize the training workload across fleets of distributed commodity servers. There are two main ways to parallelize training: data parallelism and model parallelism. In addition to the model’s training phase, another big challenge of deep learning is that the input datasets are continuously growing, which increases the number of parameters to train against. Not only does this mean that the input dataset may exceed available server memory, but it also means that the matrices involved in gradient descent can exceed the node’s memory as well. Thus, scaling out, rather than scaling up, is important as this enables the workload and associated dataset to be distributed across multiple nodes, allowing computations to be performed in parallel. Fault Tolerance. Many deep learning algorithms use checkpointing as a way to recover training data in the event of failure. However, frequent checkpointing requires significant system overhead. An alternative is to leverage the use of multiple data replicas hosted on separate nodes. These replicas provide redundancy and data availability without the need to consume resources on the primary node of the system. Consistency. For most deep learning algorithms it is recommended to use a strong data consistency model. With strong consistency each node in a distributed database cluster is operating on the latest copy of the data, though some algorithms, such as Stochastic Gradient Descent (SGD), can tolerate a certain degree of inconsistency. Strong consistency will provide the most accurate results, but in certain situations where faster training time is valued over accuracy, eventual consistency is acceptable. To optimize for accuracy and performance, the database should offer tunable consistency. Remember, if you want to get started right now, download the complete the complete Deep Learning and Artificial Intelligence white paper.